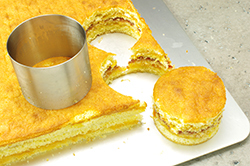 A layer cake says “It’s a special occasion.” Miniature layer says “It’s extra special. These individual cakes are definitely not a cupcake, perhaps more of an overgrown petit four. However you’d like to term them, they’re wonderfully delicious, and a stunning presentation for any celebratory occasion. (1) PREHEAT the oven to 350°F. 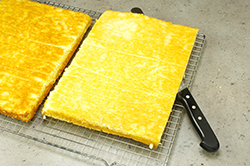 PREPARE a rimmed half sheet pan by buttering well and dusting with flour, or by spraying with a flour-infused oil baking spray. 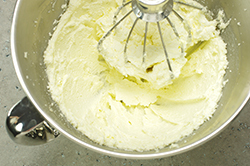 (4) ADD the white chocolate, extracts and lemon zest to the mixture. BEAT on low until incorporated. 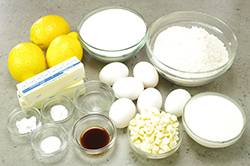 (5) COMBINE in a separate medium bowl, the flour, baking powder, baking soda, and salt. 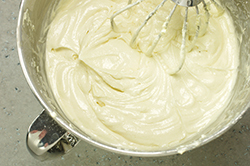 WHISK until the dry ingredients are evenly distributed. 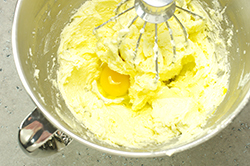 (6) WHISK together the buttermilk and lemon juice. 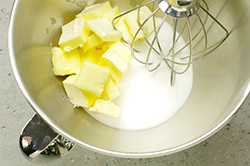 (7) ADD one-third of the flour mixture to the butter-sugar mixture and BEAT on low until combined. POUR in one-third of buttermilk mixture, combine until incorporated. (8) REPEAT with the addition of the second third of the flour, followed by the second third of the liquid. ADD the final third of flour and final third of liquid. 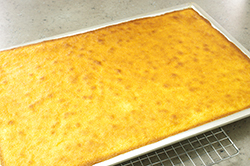 (9) POUR the batter into the prepared half-sheet pan. Smooth the batter evenly across the pan. (10) BAKE in the preheated 350°F oven for 20-25 minutes, or until a finger pressed in the middle of the cake springs back. Do not overbake. 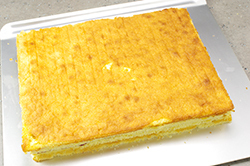 (11) COOL the cake in the pan for 15 minutes, then INVERT onto a cooling rack and continue to cool for an hour. (12) CUT the cake in half for easier management. SPLIT each half horizontally with a long-bladed bread knife. There should be 4 equally-sized layers. (13) PLACE the first layer, top side down on a working surface. 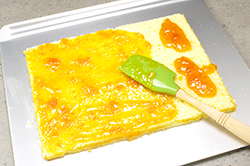 SPREAD a thin layer of strained apricot jam on top. 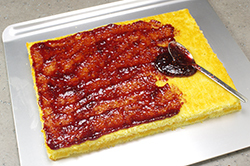 (15) SPREAD a thin layer of raspberry jam on top of this second layer. ADD a third cake layer. 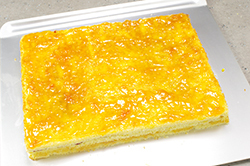 (16) SPOON and spread another layer of apricot jam on top, and PLACE the fourth and final cake layer. 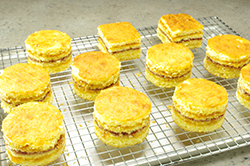 (17) CUT the layered cake into 12 squares, or using a biscuit cutter, cut 10 rounds. 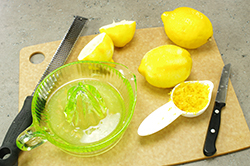 (18) BRUSH any extra crumbs away from the cut sides and working surface. Set aside while preparing the icing. (19) SIFT the powdered sugar into a large glass bowl. 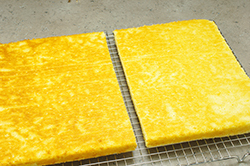 Add the hot water and corn syrup and mix until smooth by folding with a spatula. (Avoid vigorous stirring or whisking – bubbles are the enemy in this icing situation). (20) MELT the white chocolate in the microwave in 30-second intervals. Allow the chocolate to stand between intervals to permit the chocolate time to melt; stir between intervals until smooth. Alternatively, melt the chocolate in a glass bowl over boiling water. (21) ADD the melted chocolate to the sugar mixture and stir until smooth. Add the vanilla and lemon flavorings. (22) DIVIDE the icing into separate bowls for coloring. 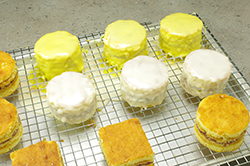 We chose white and pale yellow for our cakes. ADD the food coloring by dipping a toothpick in the color, then into icing. This allows the color to be gradually added. Resist the urge to just plop in a drop. (23) PUT the icing over a hot water bath with the water kept at a simmer. The fondant will harden quickly as it cools, but will become nicely fluid whenever reheated. 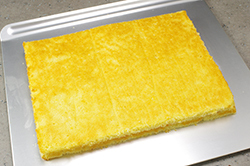 (24) PLACE a cooling rack inside a baking pan; this will catch any excess icing that drips away. POSITION the cake stacks on the rack. (25) SPOON the icing over the cakes starting with a covering on the sides, follow with a final spoonful over the top. 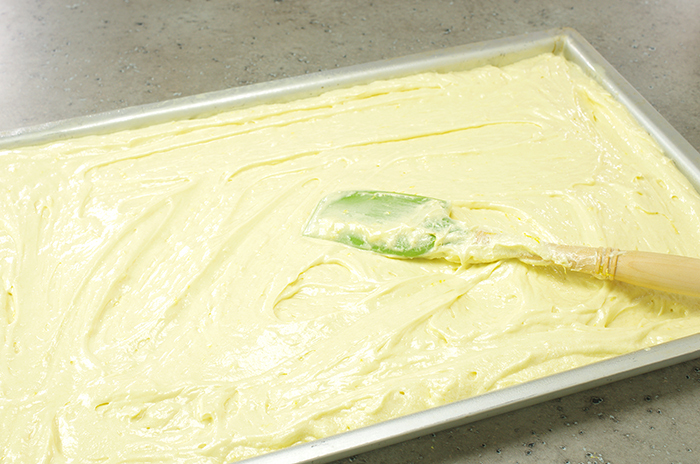 A slight jiggling of the pan will help the icing to settle into a smooth coat and for any excess icing to drip away. The icing will harden fairly quickly. While the icing is still hardening and pliable, cut away any excess icing with a knife at the base of unit. 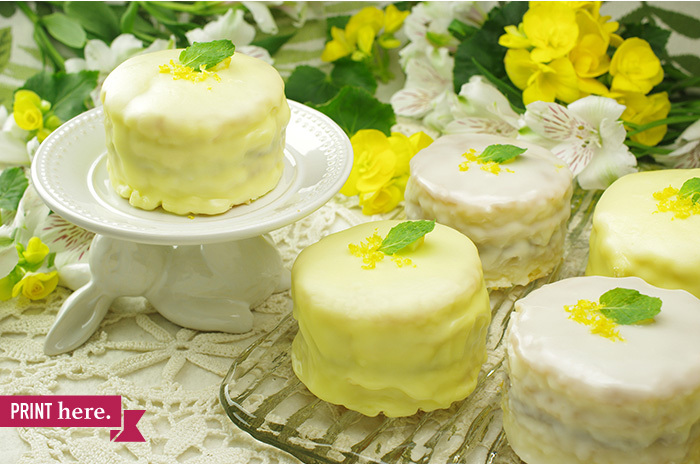 (26) GARNISH the little cakes with a mint leave and a pinch of lemon zest on each cake.